Peter said, "Explain to us what you said earlier to the people." Jesus said, "You still have trouble understanding? Surely you know that all the food that enters a person's mouth goes into the stomach. Then that food goes out of the body. But the bad things a person says with his mouth come from the way a person thinks. And these are the things that make a person wrong. All these bad things begin in a person's mind: evil thoughts, murder, adultery, sexual sins, stealing, lying, saying bad things against other people. These things make a person wrong. But not washing his hands before he eats does not make a person wrong." 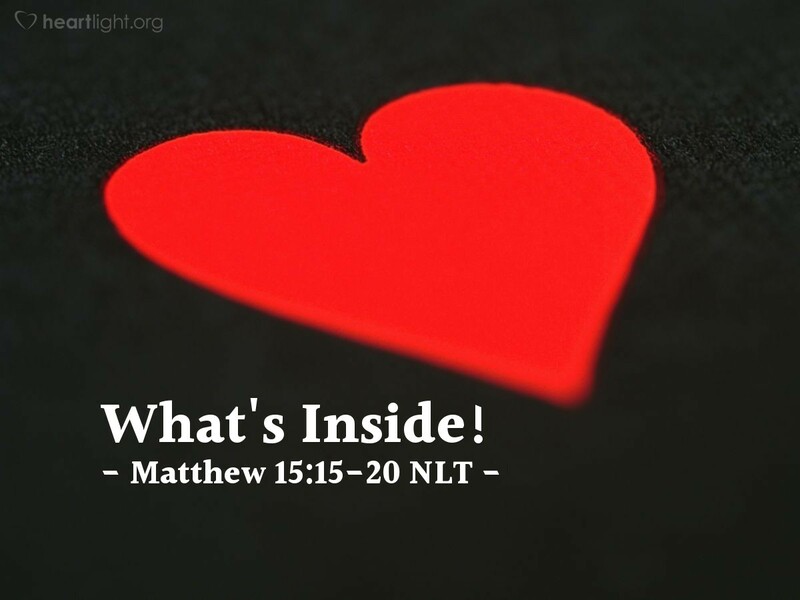 Jesus had to remind his disciples of this repeatedly—it's what's inside your hearts that counts most. This is not because the interior world of the heart is isolated from actions—we can think something nice, feel something nice, and let feelings and thoughts take the place of actions. No, it's precisely because this interior world always has a way of revealing itself in behaviors that we must keep our hearts pure. Jesus is after right actions, good deeds, decent behaviors, and honorable character. But these things are ultimately and consistently reproducible because we keep our hearts pure and are committed to honor God in the way we live. O Lord God, Almighty Creator and Sustainer, why you choose to love me with your grace is a great mystery to me. You know my thoughts. You know my motives. While I am working on making those areas of my life more holy, I recognize that I need the cleansing and power of your Holy Spirit in the inner most places of my existence. Cleanse my heart and conform my thoughts to your will. In Jesus' name I pray. Amen.